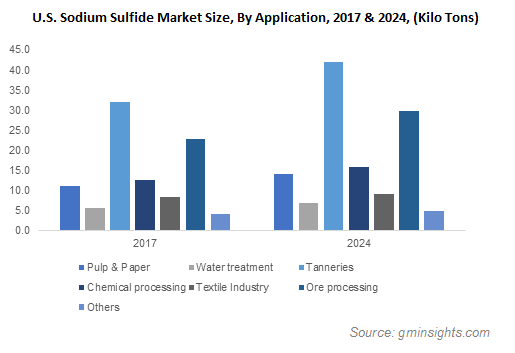 Pulp & Paper « Global Market Insights, Inc.
Vinyl ester market has lately been emerging as one of the most lucrative business spheres in the bulk and specialty chemicals industry owing to the increasing popularity of light weight and high strength polymeric materials over metals. Vinyl ester possesses lot more benefits such as non-corrosivity, chemically inertness, and design stability that has been prompting energy companies, non-metal product manufacturers, and shipbuilding firms to use it in various non-metal formulations. The increasing popularity of green energy alternatives especially wind energy for curbing the carbon footprints is also proliferating the demand for vinyl ester on a large scale. Currently, with the rise in per capita income, most of the industry magnates have been investing in the development of private ferries for traveling through inland waterways. The substantial use of vinyl ester for building strong, lightweight, and comfortable ships will have a considerable influence on vinyl ester market. Corrosion resistant materials are widely used for manufacturing glass containers, painted steel, stainless steel components, and other varieties of general purpose products. Among those, vinyl ester is generally a more preferred material owing to its capability to stand humid and harsh environmental conditions such as high pressure, high temperature, and highly saline water. Vinyl ester resin is also used to manufacture fiber reinforced plastics (FRP), used as an alternative over exotic metal hybrid products. The material is also used for fabricating industrial equipment and structures including process vessels, pipes, absorption towers, storage tanks, ducts, hoods, and exhaust stacks. Reportedly, in 2017, pipes and tanks held a major proportion of vinyl ester market share. As of now, most of the countries have been shifting their focus toward the deployment of renewable energy solutions for fulfilling their energy needs. European nations such as Ireland, Portugal, and Denmark have been heavily investing in wind power for generating electricity at a cheaper rate. In fact in 2016, wind energy accounted for 85% of renewable electricity generation in Ireland. 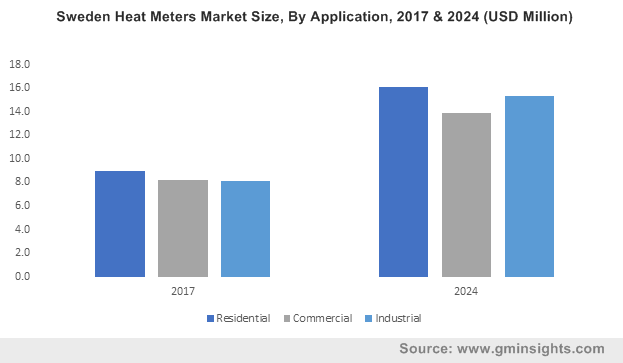 The rapidly expanding wind energy sector across the globe has been having a major impact on vinyl ester market, as most of the structures are manufactured with FRP materials in which vinyl ester resin is used prominently. The main reason behind the increasing deployment of vinyl ester resin over epoxy resin while manufacturing wind turbine blades is its low infusion viscosity and excellent curing capability. In long wind turbine blades, the use of epoxy resins may lead to a rise in curing time which ultimately decreases the wind blade manufacturing rate. 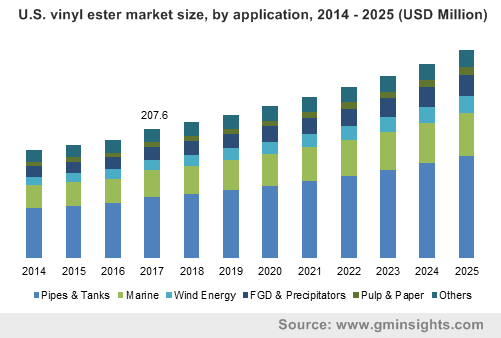 In fact, in order to maximize the productivity of wind turbine blade manufacturing plants, vinyl ester resin is most extensively used, thereby augmenting vinyl ester market size over the years ahead. 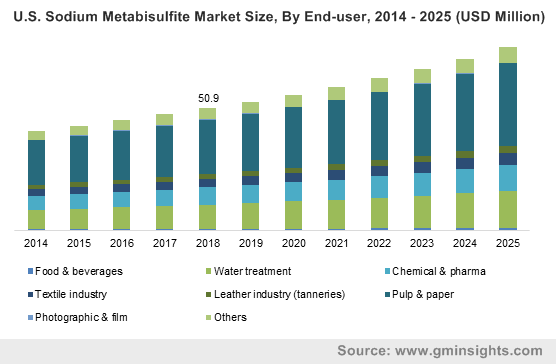 Taking into account the future business opportunities in the vinyl ester industry, several chemical manufacturers have been teaming up to launch qualitative vinyl esters. For instance, in August 2018, Aliancys and AOC collaborated to establish a new company involved in the production of vinyl ester resin, polyester resin, gel coats, and other materials required to develop the composite materials. The duo is planning to enhance their customer base by offering excellent prospects and quality products to the end-use companies. This kind of collaborative approach will help companies leverage their regional reach and strengthen their technology expertise effectively. 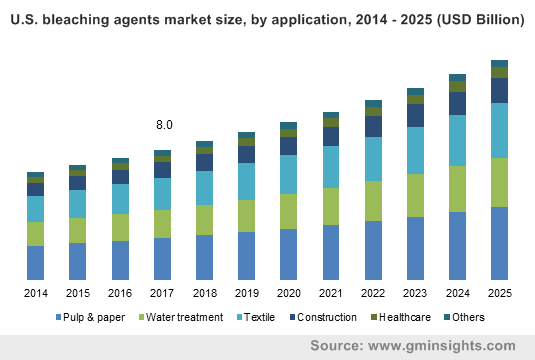 The strategy adopted by industry contenders to accelerate product innovation and their service portfolio will propel vinyl ester industry trends in the years to come. The extensive use of vinyl ester resin not only in the wind blade manufacturing process but also in the various industrial equipment development is poised to enhance the product demand significantly. For the record, by the end of 2025, vinyl ester market will surpass a revenue collection of USD 1.7 billion. This entry was posted in Bulk & Specialty Chemicals and tagged Bisphenol A, Brominated Fire Retardant, FGD & Precipitators, Global Vinyl Ester Market, Marine, Novolac, Pipes & Tanks, Pulp & Paper, Vinyl Ester Market, Vinyl Ester Market Forecast, Vinyl Ester Market Size, Vinyl Ester Market Trends, Wind Energy.